Ample storage space to enhance any bathroom decor. 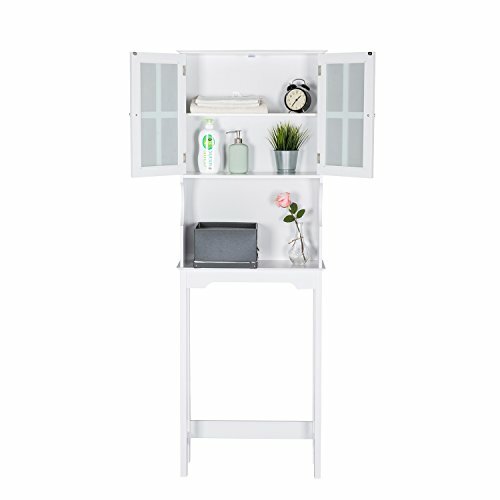 Features an two-door cabinet and an open shelf for easy access storage. The cabinet provides excellent storage solutions for bathrooms with limited space. This bathroom space saver features sturdy MDF construction, and its white finish ensures that it will match and accent any existing decor. It is a free standing furniture piece with the graceful curve cabinet leg, which conveniently fits over standard toilet tanks and adds easy storage for roll paper and other bathroom necessities. 【OVER THE TOILET DESIGN】This Wood Bathroom Organizer Which is Designed to Save Space while Creates Additional Storage in Your Home's Bathroom, an Open Space Purposely Left at The Bottom, It Conveniently Fits Behind most Toilet Setups and Its Color and Construction Complement Many Interior Styles.